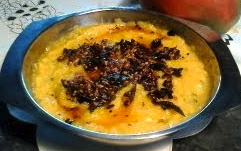 Raw mango and coconut chutney is very spicy and delicious chutney. Every thing is raw in here except the tempering which makes it very healthy. Wash & cut mango & coconut into small pieces. Keep a medium sauce pan on medium heat. Take oil in the pan. When the oil is hot add red chili followed by fenugreek seeds, mustard seeds and cumin seeds. Keep stirring. When the mustard seeds are spluttering and red chili is changing color, add hing(asafoetida) and curry leaves and turn off the stove. Separate the red chili from tempering and add to mango and coconut. Add turmeric and salt also to these ingredients. You may also add a little jaggery if your mango is very sour. But in this case I did not add jaggery because my mango turned a little sweet. Now take all these into your food processor and blend them into a chunky paste. Do not add any water. After blending add the chunky chutney to the tempering and mix well. Adjust the salt. This can be a good compliment with rice or chapati. You may also use it as a dip for idli or dosa. ﻿If you blend all the raw ingredients in the mixer or blender you will get a fine paste. 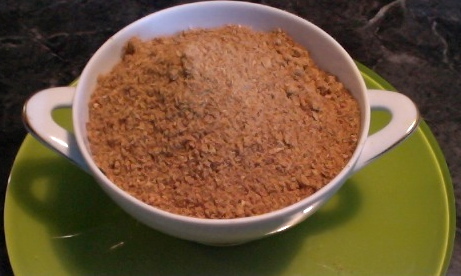 But if you use a food processor you will get a chunky paste which resembles the one that comes in the stone grinder. And the chunky paste will be more enjoyable with rice. 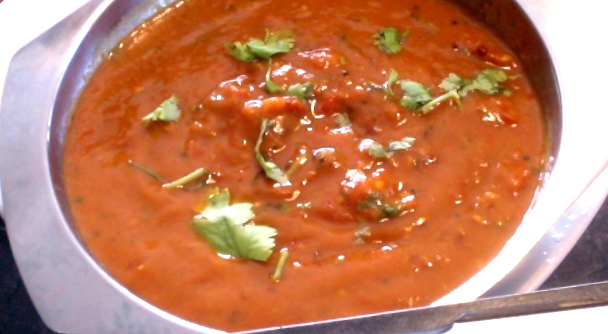 The fine chutney is more suitable for idli or dosa. Mango is a good source of vitamin A and C.
Coconut has anti fungal properties.